Coca-Cola is a franchise as a product distribution system and the largest beverage company in the world. As a product and trade name franchisor, The Coca-Cola Company licenses its franchisees to sell and distribute the end product using the franchisor's trademark, trade name, and logo. Although this franchising model looks very much like a supplier-dealer relationship, there is a huge difference in the degree of the relationship. The Coca-Cola franchisee (bottler) generally may only sell the Coca-Cola product line, vs. a supplier-dealer relationship where the dealer may offer a wide variety of products and services, some of which directly compete with each other. Soda fountains were first introduced to the United States in the early 1800s as an apparatus to sell the healthful benefits of "soda waters." Flavored sodas go back in the historical record to 1809, when carbonated ginger beer was referenced in a Practical Treatise on Brewing. By the 1840s there were over fifty soft drink manufacturers, with distribution typically being controlled by the soft drink bottlers, as well as by the manufacturers of soda fountain equipment. By the 1880s soda fountains were enormously popular, functioning as important social hubs and found in a wide variety of locations including train stations, candy stores, ice cream parlors, department stores, and - most importantly for our story - pharmacies. In 1886, pharmacist Dr. John Pemberton--a Civil War veteran with a morphine addiction--created "Pemberton's French Wine Coca," made from coca wine and kola nut, as an attempt to come up with something that would help him overcome his addiction. Unfortunately, Dr. Pemberton's home city of Atlanta passed Prohibition legislation in 1886, so to be able to sell his distinctively-flavored product, he recreated it without alcohol, renamed it to "Coca-Cola," and began selling the syrup concentrate to pharmacies in Georgia. By 1888, the product was already being marketed across the United States, with the top-secret recipe and much-loved flavor that we still know today. Coca-Cola's franchising system dates back to 1889 when bottling rights began to be sold to businessmen who were capable of large-scale bottling and thus were able to quickly expand the product into new markets. One of the early 'brand standards' set for the system was an agreement by the bottlers to only sell the product in a standard and unique 'contour' bottle, patented in 1915 and since immortalized by artists such as Andy Warhol and still in use today. With this franchising model, the franchisor avoids the costs normally associated with manufacturing, storage, and distribution of the end product. 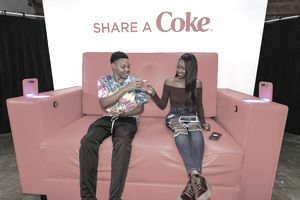 As the franchisor and owner of the brand, The Coca-Cola Company is responsible for consumer marketing initiatives, but it is the responsibility of the bottling partners to merchandise the product within their territories. Historically, The Coca-Cola Company has relied upon independent bottling franchises for the bottling and distribution of its beverages. In the early 2000s, however, the company began temporarily taking ownership of some bottling operations as part of its Bottling Investments Group (BIG) program, to stabilize certain operations and guide growth in some markets. Once an operation is deemed stable and thriving, a qualified bottler is found to assume the operations and continue to grow the business. The BIG program also helps ensure brand excellence around the globe. In 2013, The Coca-Cola Company announced a return to a franchising model in the U.S. The refranchising is intended to reduce costs associated with maintaining delivery trucks and warehouses while retaining control over the bottling process. The company continues to negotiate franchising agreements and discuss with potential partners about investing in the Coca-Cola system in the United States and its global markets.